In which architectures does learning make fun? Will one be able to choose one’s lesson times in future? Will one still have lessons at all? 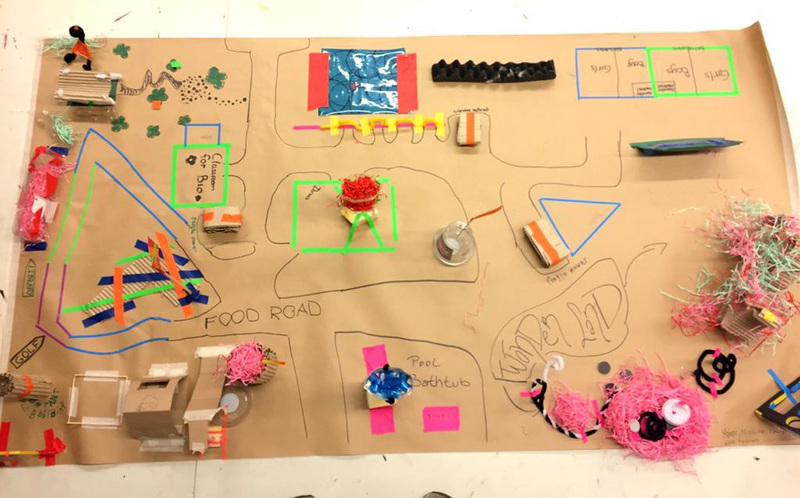 During the course of the 2017/18 school year 9th and 10th grade students developed ideas on what school buildings could look like in future. They explored reform-pedagogical ideas for schools—from Montessori and Makarenko to John Dewey—and interviewed students at the Summerhill boarding school in Suffolk on what it is like to attend the oldest democratic school in the world. Starting from the building plans for the boarding school and buildings from the architect Zaha Hadid, they designed 3D plans for alternative school concepts. Whether riding arena, swimming pool, cinema, or cafeteria—all the results were compiled in a book. The Nelson-Mandela-Schule is an integrated secondary school with an upper grammar school and a UNESCO project school in the Wilmersdorf district of Berlin. It is an international, bilingual school. Lessons are held in German or English. With the teacher Hanna Lentz. Nika Dubrovsky is an artist. She is the initiator of the project Anthropology for Kids, inspired by soviet children’s literature, established in Berlin in 2008. In 2015, together with the Karussell e. V., she organized the workshop Mein Museum for children aged 6 and up and published a free writing practice book in Russian.